Your guide to good reads, authors and all things literary in the Carolinas. Ruthie Houston, the woman who inspired the beloved children's book, "The Year of the Perfect Christmas Tree," died Wednesday at 99. Born in Avery County in 1914, Houston was the mother of Gloria Houston, author of 11 books, including her most famous, "The Year of the Perfect Christmas Tree," a best-selling picture book set in the North Carolina mountains during World War I. Since its publication more than 25 years ago, Houston's Appalachian tale has sold millions of copies and become a holiday classic. Its main character is a little girl named Ruthie who's supposed to play the heavenly angel in her church's annual Christmas Eve play. Though that book brought Ruthie the most notoriety, she was beloved in Avery and Mitchell Counties long before that. A natural storyteller, she for years entertained schoolchildren who visited her Sunny Brook Store in Avery County to hear the stories of mountain life that inspired her daughter's books. In December, I wrote a story about Ruthie and her birthday wish. For her 100th birthday, which would have been on March 9, she wanted people to donate money to help reduce the national debt. She even made a video, which you can watch on YouTube. 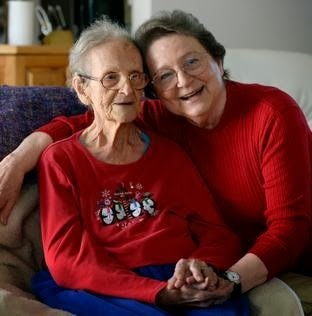 Ruthie was concerned the debt could threaten the many government and social programs that helped alleviate poverty and suffering in her lifetime. When I interviewed Ruthie in December, she recounted stories of family members who died for lack of medicine or government safety regulations. "I just don't want those things to happen again to my children, my grandchildren, my great-grandchildren," she said. "We have come so far with having necessities. But I don't want them to have to go backward instead of forward." On Wednesday evening, as fluffy snowflakes fell outside the window of Ruthie’s room a glowing sunset broke through the clouds lighting her face. In that glow, about 6:30 p m, I held her hand as she stopped breathing and was gone. This was the visual image with which she left me. Her death was peaceful, and our conversation was vital until a few moments before. She was disappointed that she would not celebrate that 100th birthday and that she would not be voting for a woman for President, but she said that she was “so tired.” Her heart was exhausted from the effort of the past few weeks, but, on Tuesday she had visited with Jerry for much of the day as she worked on her latest napkin making project, at the request of a friend. Then she walked to her bathroom and to the table to join us for pizza--with garlic. Ruthie was only disabled for one day. Until her final moments, she was mentally active, only last week calling for a friend’s birthday (on her own cell phone) to sing the rhymed couplets she had composed specific to that friend. Her leaving was much as she had wanted it to be. We are blessed to have had her among us for almost 100 years. Gloria's comments on Ruthie's last moments moved me to tears. What an eloquent and moving way to describe the passing of someone who was loved so much. We still read "The Year of the Perfect Christmas Tree" every Christmas Eve.....now reading it to my granddaughter. Such a lovely story about a time gone by and the sacrifices that were made in a difficult situation. My condolences to Ruthie's family, may their years of memories continue to comfort them. IT MADE FOR A PERFECT CHRISTMAS CARD TOO! For over 30 years, instead of Christmas cards, I've sent an illustrated book to my friends. The Year of the Perfect Christmas Tree was among the most popular I sent. The beginning of love is to let those we love be perfectly themselves, and not to twist them to fit our own image. Otherwise we love only the reflection of ourselves we find in them. See the link below for more info. Health is one of the many aspect in our life that we should take good care because if we are sick , we became useless and unimportant. We loose hope and everything became stagnant. Visit my site for more information. Thanks. Thank you, this article really help me to understand more than before. Dannye Romine Powell has published three collections of poetry (University of Arkansas Press), and a non-fiction book, "Parting the Curtains: Interviews with Southern Writers" (John Blair). Over her years at the Observer, she's served as book review editor, feature writer, restaurant critic and local news columnist. Count on her for news of Carolinas authors and write her at dpowell@charlotteobserver.com.